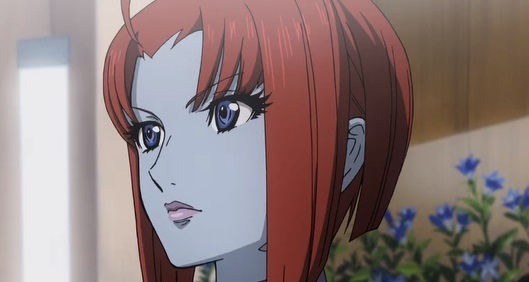 Episode ten of Space Battleship Yamato 2199 reveals that the series might be trying to position itself as both a meta-narrative on war and a reconciliation with the reality of Imperial Japan’s history. True to my suspicions from episode 9, this chapter returns to the idea of cooperation and co-existence with the Gamilans. Further reinforcing this thesis is the fact that the Yamato doesn’t fire single shot in anger, thus maintaining its white knight status. Here’s the overview. A warp jump gone wrong lands the Yamato inside a dimensional rift. The area is dubbed a universal Sargasso Sea after Chief Tokugawa reports that the rift is draining power from the wave-motion engine. The tranquility of the starship graveyard is further shattered when a Gamilan destroyer snaps to life. Thus begins a story of cooperation wherein the Gamilans propose working together to escape the rift. If the Yamato fires its wave-motion gun at a point where reality meets the dimensional barrier, it will form an exit portal. The Gamilan destroyer will then tow the energy depleted Yamato to safety. The captain of the Gamilan destroyer does make clear that once they are outside the rift the Terrans and Gamilans are enemies once more. This temporary alliance allows the Yamato’s crew their first look at a live Gamilan; a female blue-skinned fighter pilot named Melda Ditz, who is the daughter of Admiral Ditz – who is apparently a somebody. Which brings me to my next point, other than Dessler and his elfin Minster of Propaganda, I have a really hard time keeping track of the various individuals within Gamilas’ High Command. Their names are often infodumped into a scene without any real context. This probably accounts for why I always feel like I’m out of the loop when the action cuts to some Gamilan political intrigue. Don’t get me wrong, I like the over the top voice acting – even in Japanese the ham is delicious – hyperbole, and fascist rants that come from most of the Gamilan characters. There are moments when I think the writers are having fun with Nazi ideology much in the same way that Quentin Tarantino did in Inglorious Basterds. The problem is that there are too many named Gamilans being talked about without getting enough useful screen time. That’s writing 101 right there, guys. You can’t just show off a character, flash their very German High Command sounding name on the screen, and expect the audience to give a damn. Without some connection to the overall conflict they are just speaking props. Meanwhile, through Melda Ditz’s role as temporary ambassador, we are presented with a potential revelation. Ditz claims that Earth started the war with the Gamilas. During a Kodai-led interrogation, she alludes to a Terran sneak attack without any formal declaration of hostilities. This open a wholly interesting dimension in understanding the series. Everything we know about the Yamato and the UNCF has been filtered through the lens of a defensive war. Gamilas attacked Earth, and in doing so put humanity on the righteous side of the conflict. If Earth is the aggressor, then the entire subtext of historical revision falls out from under the series’ feet. 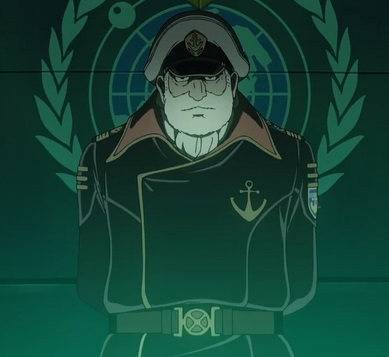 Yamato 2199 could be about Japan owning its part in World War Two, rather than trying to change it into some mytho-heroic nonsense wherein the home islands were history’s victims. Given the way the series has poured on the Third Reich allusions as witnessed on Planet Gamilas and in the blue-skinned Gamilans, I was not expecting to see meaningful reflection on Japanese ethos as personified in the United Nations forces. More on this in future episodes, I hope. During the escape from the rift, we witness an “imperial guard” blue-skin Gamilan, an unsubtle representation of an SS officer, attempting to strand the Yamato in the Sargasso dimension. The destroyer’s second-class Gamilan captain eventually rescues the Yamato, but not before the blue-skined SS man can send a distress signal to high command. Once both ships return to normal space they are greeted by a flotilla of Gamilan starships. At the helm of this small fleet is Commander Goer, a blue-skinned Gamilan we’re supposed to remember from a few episodes back. Desperate to vanquish the Yamato, Goer doesn’t even wait for the Yamato’s rescuer to clear the line of fire. The destroyer is sunk with all hands. Somehow, without so much as a briefing from Sanada, Captain Okita knows to get the Yamato away from the rift before it opens up and eats the aggressor Gamilan fleet, save for Goer’s flagship which warps away leaving his men to their doom. Perhaps the subtitles missed something, or maybe Okita is just that much of an expert sailor. And thus ends episode ten. Enemies come together to escape common plight. Honour and mutual respect between soldiers carries the day. And the first live contact between Earth and Gamilas ends up with a prisoner situation aboard the Yamato. Will this continue? Will we see less jingoism and more grey areas starting to emerge? Granted the destroyer pulling the Yamato out of the rift isn’t quite the image of WW1 soldiers playing soccer between trenches, but it’s a step toward that much more meaningful narrative of war.